Robbie gave up alcohol and refocused on bodybuilding after a 20-year hiatus. At age 41 and reeling for help, he gave himself back to the sport and made friends in the right places! I was always a strong and stocky kid growing up. However, during my senior year of high school I was diagnosed with leukemia and my life was changed forever. At first diagnosis I was in denial and turned to drugs and alcohol as a way to cope. As time went on, I went through recovery and moved to the northeast. A friend got me a job as a lifeguard and I met another lifeguard who was into weight training. During that summer, I went from a sickly 135 to 175 pounds. I didn't do anything unique; I did the basics like eating right, BCAAs, and regular weight training. When I returned home that summer, I went to a local Gold's Gym where an employee approached me and asked if I would be interested in competing in some teenage shows. I was blown away that I was accepted into their club and graciously accepted the offer. They showed me how to train, eat, and pose. I was hooked, and the people in that gym became my extended family. 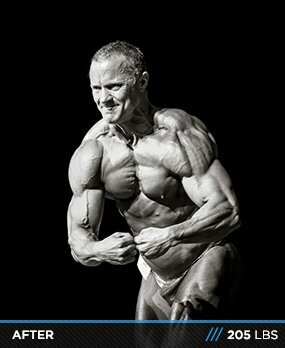 A few months later, while training for my first bodybuilding show at age 18, I was struck by an 18-wheeler on my motorcycle. While lying in the hospital for a few months with two broken legs in multiple places and a broken arm, I became more determined than ever to overcome the accident. Shortly after leaving the hospital, I was back in the gym with casts still on three limbs. One year later, I took second place (middleweight) at my first show. Throughout the next five years, I won more shows, graduated college, got married, and had two beautiful boys. My focus went to my job and family and I didn't step into a gym for 20 years after that. About seven years ago, my wife and I divorced and I started hanging out with friends at happy hour nearly every night of the week when I didn't have my kids. My social life and friends all revolved around drinking in some form. After a few years of this unhealthy life, it became a problem again and I landed back in the hospital. A dear friend of mine, Leia Kress, who used to go to my shows 20 years ago, was working at Gold's Gym by my house and suggested I come in to get back into shape. After a year of training, she suggested I should start training for a show. 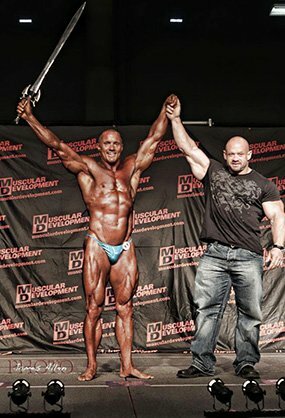 I went into overdrive, buckled down, and entered the Texas Shredder (one of only two drug-free NPC shows in Texas). I changed everything in my life to stay committed. I lost a few friends who couldn't accept me abstaining from alcohol. I became strong physically and emotionally and didn't adhere to peer pressure. You wouldn't think peer pressure exists at 40, but alcohol was a strong bond between me and my friends (golfing, poker, cookouts, and birthdays). There were many times that I was isolated because my old friends couldn't accept my new lifestyle. It was scary to change at first, but I stayed committed to my health. I made new friends over time and reinvented myself. I became a better father, employee, and person. I started to feel good about myself, which spilled onto others. My kids were a huge part of my transformation. They saw me change from a lethargic, unhappy, and depressed person into a powerful, strong, and committed individual. I'm a better person all around now. I'm better for myself and my kids. I probably would not have been successful without the help of others. Leia encouraged and helped me from the beginning with nutrition and dieting for all my shows. She made me believe in myself. I had lots of doubt early and up to my first show. She was there the entire time telling me I could do it. During that time, I also met IFBB pro Dave Goodin. Dave showed me how to battle though age and still be competitive. He became my friend, mentor, and posing coach. I continue to work with Leia and Dave for every event and will do so for as long as I can. I love having supportive and knowledgeable people in my life who show me the way. I find myself looking for a supportive environment to train. I think it's part of evolving as a bodybuilder. I settled down at MetroFlex gym in Austin, Texas. It's imperative to surround yourself with likeminded individuals who help and support you. I needed lots of help with my diet. 20 years ago, the rule of thumb was 25 percent protein, 65 percent carbs, and 10 percent fat. Now it's more like 40 percent protein, 40 percent carbs, and 20 percent fat. Leia, who is also a nutritionist and works with many competitors, helped me find what I responded to best. My diet changes as I get closer to a show. I normally start out around 3750-4000 calories per day and slowly drop them (mostly carbs) each week to finish around 2200 calories. I do 45-90 minutes of HIIT cardio every day and try to adjust my diet based on the success of my fat percentage goals from the prior week. I usually plateau somewhere in the middle at around eight percent body fat. I may lower my carbs and increase cardio for a few days during that time or increase my calories so my body gives up the fight for fat. I'm a big proponent of training each body part once per week and lifting pretty heavy for most of my show prep. The biggest problem was finding time for cardio, meal prep, training, posing, and raising two boys. I experimented getting up at 4 a.m. and doing the bulk of my cardio before my first meal and being back home in time to get the boys off to school and me to work. I trained during my lunch hours and finished the rest of my cardio before bed. I always hit a plateau somewhere around eight percent body fat and it is was challenging to find ways to get over the hump. I always plan long diets (14-16 week) as a result. I learned that increasing my calories and cardio got me over the hump pretty quickly. Now I only give myself 12 weeks. 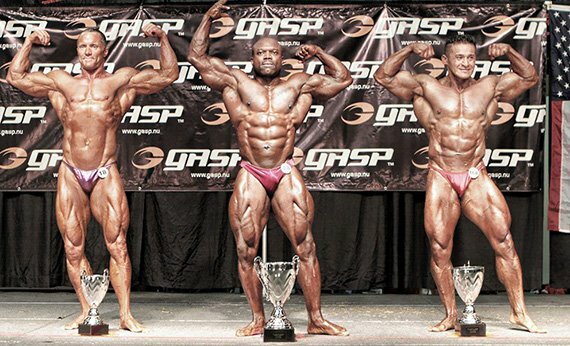 My goals for 2013 are to qualify for Junior Nationals by competing in the Phil Heath Classic in March, Junior Nationals in June, and the Master's Nationals in July. Always be mindful of where you were. Don't always live in the future and be mindful of the present. I love Bodybuilding.com because I can buy supplements and actually see ratings. As a newcomer, I really relied on that. I enjoy the network and the community. I love Jamie Eason (my girlfriend follows her programs religiously) and the tracking tools, which allow me to see where I've been and how much I have to go.